Moses Grandy, b. 1786? Narrative of the Life of Moses Grandy, Late a Slave in the United States of America. 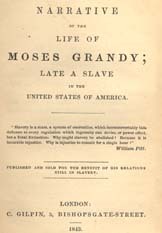 Narrative of the Life of Moses Grandy, Late a Slave in the United States of America.